One ride, one day, touching all six New England states. The seed was planted when Bill Reeves suggested it as a personal goal last fall. I relayed this idea to Austin and Joe over breakfast at Helen’s. We felt it to be the logical evolution of the Friday HP ride at Training Weekend. Party to this conversation was the man destined to become our savior, Chris Borges (formerly known as “Joe’s Apprentice”). Chris immediately volunteered to drive the SAG wagon. 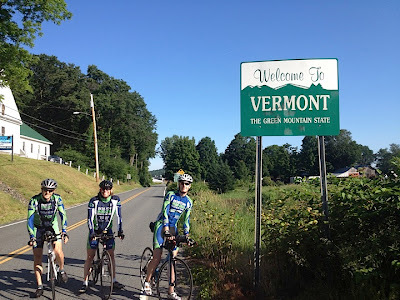 Just like that, we had everything we needed: the huge Kurtzmobile to ferry us and our gear out to the start and a driver/soigneur to move along the route to resupply us..
As late as Friday night we were still debating whether to ride up the NH seacoast or move inland a little bit. Both routes would end in Kittery after crossing in Portsmouth. Unbeknownst to us, the pedestrian/bike bridge in Portsmouth was dismantled in February. Bill sent me a message about that late Friday night. The only other options in Portsmouth are not open to bikes (I95 and Rt 1 bridges). A swim to Kittery was out. Best case: Joe would be at the outlet stores while Austin and I got swept out to sea. I scrolled up in Google maps and found the first available Piscataqua crossing. It was in Dover. We would avoid the seacoast entirely but the reroute would still add around five miles. We were looking at a 211 mile ride, assuming we did not get lost along the way. Due to work and travel schedules several of us were in no mood to wake up super early. That was a mistake that caught up with us, but we were too naive to realize it until much later. At one point during planning Austin had floated the idea that we could stop for a “real” lunch along the ride (no doubt influenced by Victoria’s track record of mid-ride four-course meals). Joe agreed that might be nice. That would soon prove to be very wishful thinking. "I hope my seat tube doesn't crack"
"I hope my handcrafted woonden bottle brackets don't crack"
At 6:00 we blitzed the breakfast bar at the Hampton Inn. 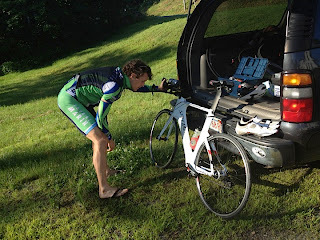 Then we lubed up our bike shorts and got in the car for the short drive into VT. I cannot explain why we did not have a sense of urgency to get started. The odometers did not click over until 7:50. That was ridiculous. The weather was spectacular all day. It just could not have been better. This ride has nearly 8000’ of climbing, yet only drops 200 feet from start to finish. The biggest climb of the day came early (mile 8). It ascends around 900 feet in three miles. We knew about this ahead of time, and had vowed to reign it in. I have video footage to confirm this (you can hear us talking in full sentences instead of the monosyllabic grunts we usually emit while climbing). There was a nice rollout down to Orange after that. 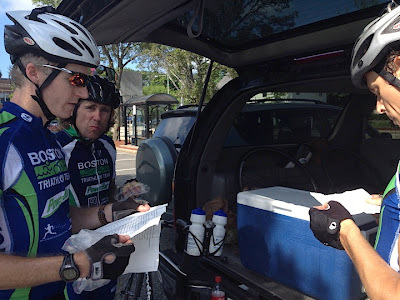 We sailed smoothly around the Eastern edge of the Quabbin Reservoir and continued down to Sturbridge where we met Chris for the first stop (just short of 70 miles). 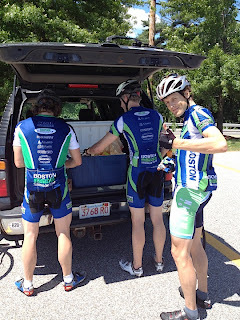 Gatorade, water, reload of gels and bars for me, homemade energy bars for Austin and Joe. We decided to go another 60 before meeting Chris, which put our next stop in Marlborough. We were shortly in CT, and there was actually a “Welcome” sign to prove it. Our route bounced back into MA, and then we exited again in Douglas. The second trip into CT was short, although we do not actually know when we crossed into RI. State boundaries just are not well marked down there. For me, this was the hardest part of the ride. It was the hottest part of the day, the terrain around there is very undulating, and the roads were not as smooth. We chose (with no regrets) to ride our tri-bikes, but we could not find a rhythm in the aero bars on those roads. It was weird to cross the century mark and know the ride was not even half over. Having exhausted our fluids we made a convenience store raid in Sutton. I was still leery of pulling the trigger on Rocket Fuel (Coke + Gatorade). Austin, deep in the glucose ditch, ate a nice helping of vanilla soft serve (try that in special needs). 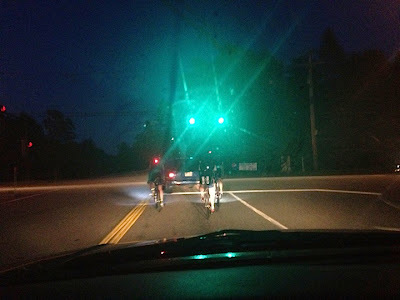 A short while on, a solo roadie coasted up next to us at a stop sign as we debated our route. With more than a hint of arrogance he asked if we needed directions. With only a hint of arrogance, we smiled and said “no thanks,” quite pleased to know that we had already gone farther than he’d probably ride that day, and we were only halfway done. As we raced up towards Marlborough I made the biggest bonehead navigational error of the day. It ended up adding around three miles to our ride. I had printed cue sheets from bikeroutetoaster.com - but I HATE cue sheets. The simpler the route, the happier I am. Cue sheets inevitably devolve into “0.3 mi, then left onto <improperly labeled> road, 0.2 mi, right at the bush, etc.” We also did not have proper GPS bike computers, and this ride was too big too fit in the memory of my 310XT. What we did have was a GMap course overlay on our phones. That is ultimately what kept us on (or returned us to) the course, but we had to stop for those position fixes. Those stops probably added around 45’ over the course of the day. 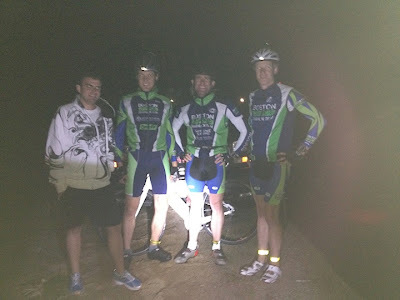 We got into Marlborough without any further detours but it was clear that we were going to run out of daylight. It was approaching 5:00, and we still had 80mi to go. We told Chris to try and get some lights for us and we would meet in Amesbury. I pulled the ripcord and started in on the Coke. The next segment took us up through Stow, Acton, and Carlisle. It was weird to finally be riding on roads we know so well after spending all day in the saddle. On 225 in Carlisle we were less than 15mi from Arlington! Navigation got easier, although we missed a turn in Billerica that set us back a little bit. We blew through Andover. My parents promised to come downtown and ring cow bells if I gave them 30’ warning, but we did not have time for cow bells. The sun was setting. In North Andover we decided to simplify the route by staying on Rt 125 to Haverhill. Before we got there I started wondering if we could earn some time by skipping Amesbury and just going straight up to Exeter, NH. A quick check on the phones confirmed that. We called Chris and told him to meet us there. 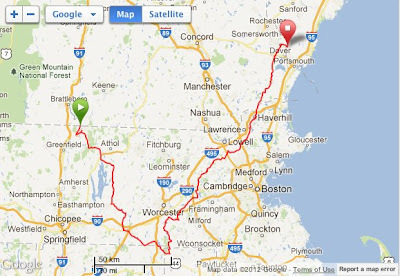 Exeter was 18mi up Rt 108. 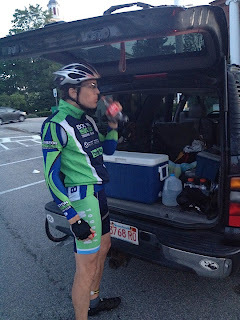 We would make it to Exeter before sundown, but Dover was another 18mi beyond that. I was hammering and frustrated. We were probably going to fail not because our bodies were not up to the task but because we had foolishly misjudged the time required for this ride. My cloud of self-pity was blown out shortly thereafter. Joe yelled out: “Just to be clear - We are finishing this.” Even if Chris drove behind us to light the road, we were going to ME. HFCS + Caffeine, what else do you need? I have never mounted lights on my tri bike, but a bunch of electrical tape solved that problem. Austin finally decided to drink some Coke. That plus the lights and OMG - it was GO TIME! If you have seen him riding full speed out to a Battle Road run, in the dark, in February, you know that he has been preparing for this very moment. It was like those lights gave him super-human powers. That last segment was probably the fastest of the whole day. It would be a lie to deny how exhilarating it was to rip along at 25mph in the dark. We were so fast Austin almost hit a raccoon. Over the last couple of miles Joe noted that he has been swimming, running, and now biking under the stars with Austin and me. Those dark sessions in Concord were much colder and much less pleasant than this clear Summer night at the NH/ME border. There was no sign as we crossed into ME, and we ended up riding an extra mile before Chris and Shay convinced us that we were actually done. It was profoundly sudden and anti-climactic. 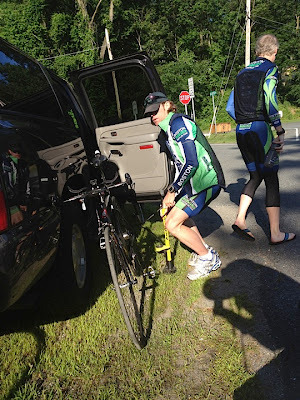 No Mike Reilly, no medals, just the shocking realization that we had ridden 218 miles and our bodies were not destroyed. I hurt more after the HP ride than I did that day. The new Sugoi team kit left neither saddle sores nor chafing. We averaged 19.2mph, and looking at my own power data I rode above my Ironman bike intensity - for almost twice the distance. It is funny what you can do without the specter of a marathon hanging over your shoulder. I will not pretend that we are ultracycling studs. Day 2 of RAAM started before we finished. What we did is a joke compared to what those people are doing as I write this. Starting a ride at 8AM and finishing at 10PM means we did not miss any sleep. That being said, we laid out a path to push beyond our normal riding boundaries. I had never ridden more than 138mi in a day. Joe’s longest rides have been the B2B. Austin has ridden across the country, but he had never gone that far in a single day. This was one of the top days of my athletic life and I am fortunate to have notched another EPIC ride with such good friends. We are lucky to have tolerant and supportive wives. We are lucky to have Chris commit so selflessly to this endeavor. What will we do differently next time? Probably leave earlier, although using the lights added a certain excitement to the end of the ride. We will definitely have the lights available. I think we will upgrade our navigational tools. If the pedestrian bridge in Portsmouth is rebuilt then we will go up the coast and finish in Kittery. I will encourage the group to revert to a high-fructose corn syrup and caffeine fueling plan earlier. The three of us are completely predictable. Two Walden loops gave way to three (and sometimes four). Conversational Battle Road runs almost immediately became weekly nine mile races. The HP ride is now a teaser for the 6SR. The 6SR is no longer an unknown that we will approach with caution. I have no doubt it will be assaulted next time. 200 is the new 100.